Think you may have what it takes to become a part of the Standby Task Force? Want to make a global difference in the way crisis response occurs? Read below to learn how our model works and then drop us a note to join our volunteer team. 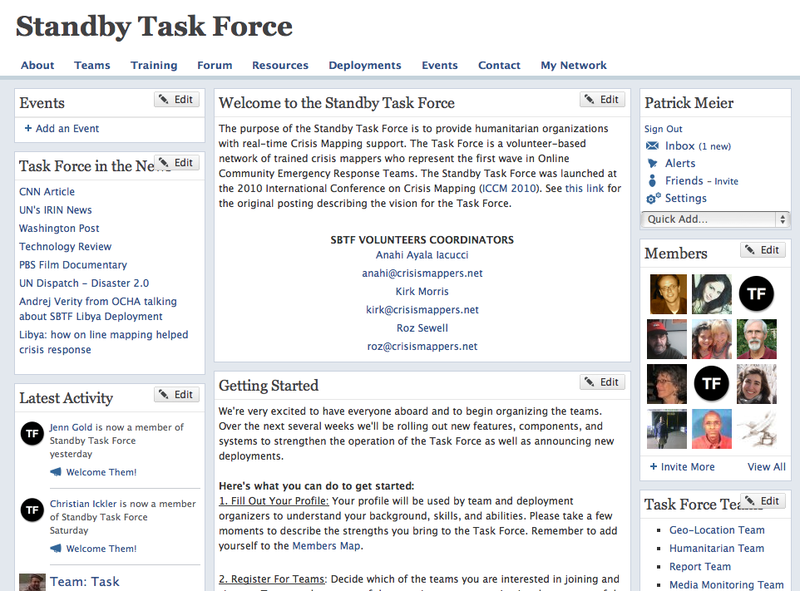 When the idea for a Standby Volunteer Task Force was first presented in public at ICCM 2010, one of the overarching goals was to develop an “open source model” for digital volunteering in support of crisis response operations with a specific focus on live crisis mapping. During the past 9 months and 6 deployments, we have refined and improved our working model for volunteer-based live crisis mapping initiatives. While these are still very much “living” documents and ones that we will continue to improve, we want to deliver on our promise to create an “open source model” for others to learn from, contribute to and improve. This page will be used to provide links to these documents and updates on our model. You’ll note from the second screenshot that that we have a very modular team structure—a total of 10 teams in all, each with a specific focus and area of responsibility. Each team has 1-3 coordinators and it’s own Skype chat group. Each team also has it’s own page on our Ning site (third screenshot) with contact information for said coordinators and training material in the form of powerpoint presentations and/or YouTube videos. 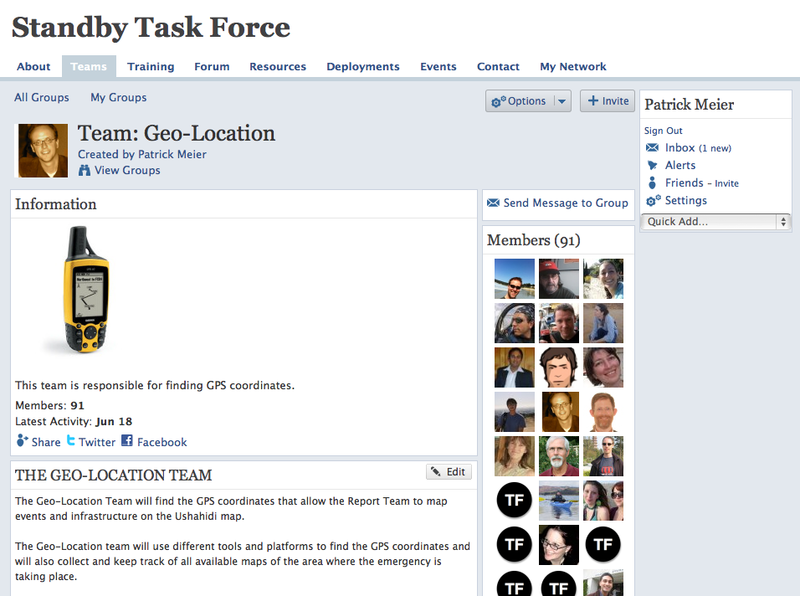 Members who are new to live crisis mapping typically join the Task Team to begin with—especially during a deployment. After this, they’ll self-select vis-a-vis which team is of most interest to them, eg. Geo-location Team, SMS Team, Verification Team, etc. To do this, they simply join the desired group on Ning and the Skype chat. 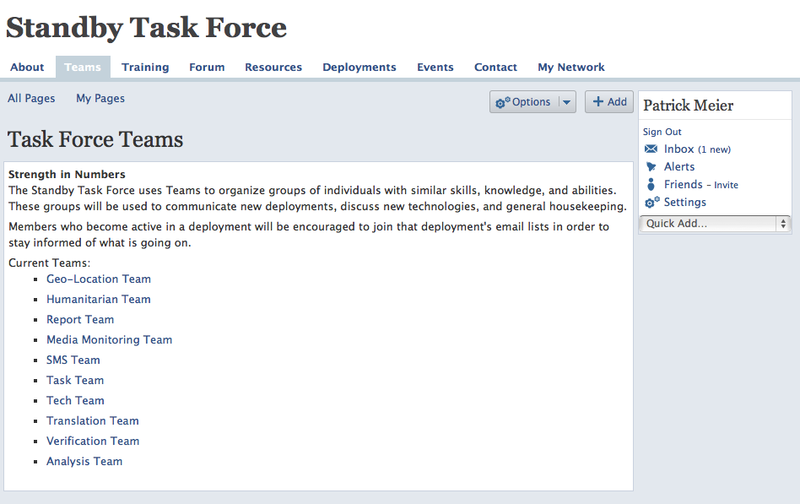 In between deployments, Team Coordinators hold customized trainings for new members of the Task Force. Each team also has a defined work flow (which we keep on refining). You can access all our work flows from this Google Doc. Please feel free to share suggestions you may have. Note that we’re still updating said work flows based on our lessons learned from the Libya Crisis Map project. You can find all our documentation for the Libya Crisis Map deployment in this Google Doc, which includes the complete operational protocol we used, workflows and security protocols. Finally, this Word Doc is an Information and Project Management Guide that describes how to design and manage a Situation Room. This document represents much of what we have learned over the past year. (Have a look at our after action report on the Colombia Simulation, which our partners at OCHA spearheaded).